He had to deal with tough questions about tea, dipping biscuits and nutmegs, but Luis Suarez just about got through probably the toughest interview he’s faced in his professional career to date. 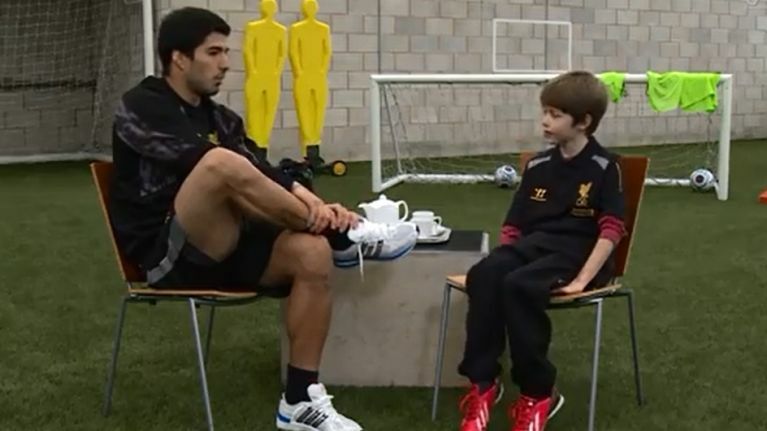 We jest, of course, because Suarez was merely the latest Liverpool player to sit down with Kop Kids presenter Finn for a pleasant chit-chat which included nuggets about dipping biscuits, his goal celebrations and his partnership with Daniel Sturridge, which isn’t quite as potent as the one formed by Finn and his friend Cameron. Finn also managed to get the Uruguayan striker to sing his own chant and convinced him to let Finn humiliate him with the trademark nutmeg that Suarez has perfected over the years. Now at least he knows how tortured defenders feel on a weekly basis.